I’ve recently started studying Korean as part of the minor I took up at university. While browsing the Internet for helpful resources I found that, not unlike myself and my classmates, a remarkable amount of students of the Korean language have knowledge of Japanese and/or study both simultaneously. As anyone casually browsing my blog might have guessed so far, I’m pretty fond of using Anki as a tool in vocab acquisition, and thus use it for Korean vocabulary as well using both existing sets and my own based on our textbooks2. Having a broad base in Japanese, I thought it would be more efficient having a link between the two languages in my flashcards. In order to assist myself and other learners of both Japanese and Korean, I wrote an Anki add-on that adds Japanese translations of Korean expressions. Similar to my previous Anki posts, this blogpost serves as a brief tutorial on setting up the add-on and adding Japanese translations to our cards. We’ll install an Anki add-on, alter our card-layout to display the Japanese expressions in a fashionable manner, and finally bulk-edit our existing cards to actually add them. 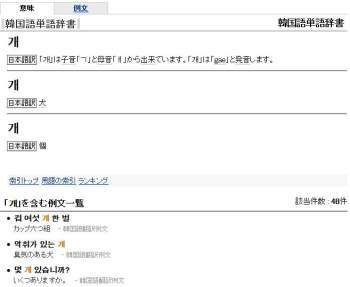 The Japanese Definitions for Korean Vocabulary add-on has a page on Ankiweb’s plug-in page, but as usual we’ll install the plug-in using the Desktop Anki application. Go to Tools → Add-ons → Browse & Install, and copy-paste 553926167 in the pop-up dialog. Restart the application to complete the installation. To create a new field Japanese, open the desktop Anki application and press CTRL-SHIFT-N (or click Tools → Manage Note Types) to enter the ‘note-type’ management screen. Select the ‘note-type’ of the cards you’d like to contain example sentences and click fields. On the next screen, click add and call the field Japanese. Now close this screen. On the previous notetype management screen, click cards. We’ll edit our lay-out and display the new field in our cards. Add the following CSS code to the shared style screen of your note’s card-type template. Add the following code to the bottom of all your different card templates’ back template. Open Anki’s browser (by pressing b or clicking Browse from the main window). The left of this browser has an overview of all your different sets and tags. Select the deck or tag containing the cards you’d like to edit. Press ctrl-a to select all of those and click Edit → Regenerate JK Expression. It will crawl the Internet for each new definition and scrape the HTML so if you have thousands of cards this might take an hour or two.